Exotic ports and onboard thrills await on Adventure of the Seas! San Juan–based Adventure of the Seas is sure to thrill, promising more time in exotic ports while providing an unmatched array of activities and entertainment onboard. Awarded the Cruisers' Choice Best for Shore Excursions Award in 2017, Adventure of the Seas will have you basking in the magic of locations such as St. Kitts, Curacao, and Bonaire. While these cruises ensure more time in port, your time onboard will still be special. 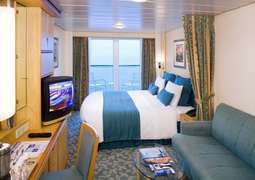 Adventure of the Seas' facilities make it the ideal venue for a company trip, family vacation, or romantic getaway. You'll find everything, from culinary and language classes to outdoor movie nights and awesome water rides. The vessel is the epitome of Royal Caribbean's tagline, "Stay Royally." 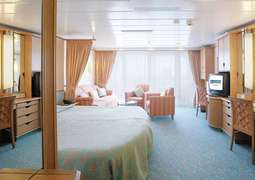 When it's time to take a break from the fun and excitement, grab a bite to eat or enjoy a relaxing evening in – Adventure of the Seas offers a superb assortment of culinary and stateroom options to suit all needs and tastes. 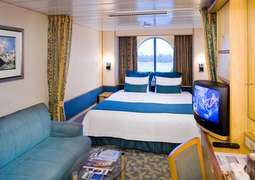 Adventure of the Seas is an exception in the cruising industry – a whopping 60% of its staterooms boast an ocean view. With colorful and dramatic Caribbean decor and attention to design and amenity details, there is an undeniable focus on luxury and comfort. 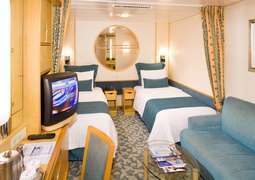 Options include standard twin/queen conversion staterooms, Royal Family Suites that are spacious enough for a family of six, and Owners and Royal Suites that include extra space, added amenities, and personalized service. With appreciation for the amount of fun and adventure to be had onboard this magnificent ship, Royal Caribbean offers Johnny Rockets, perfect for a quick grab-and-go meal. Feed the kids early and head out to savor Giovanni's rustic Italian or Chops Grille's classic steakhouse fare. Highlights of cruises with family will surely include hours by the pool and zipping down the ship's trio of Perfect Storm waterslides. Always wanting to dazzle and delight passengers, Royal Caribbean looks outside the box for surprising activities and events. Spinning around the onboard ice skating rink while cruising the waters of the Caribbean will surely be a surreal and amusing experience for your family. A reflection of the vessel's Caribbean motif, cruise casual is appropriate at most times and in most areas of the ship, although some special events and dining experiences may require dressier attire. Be sure to check your itinerary for any costumed theme nights so that you'll be prepared for the fun!